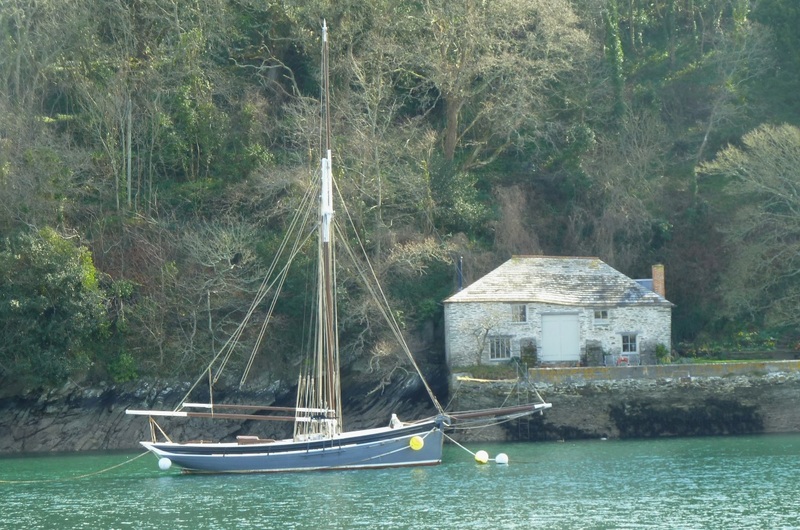 I wrote about Hesper a year or so ago, on our recent visit to Fowey she's moved to a new mooring in the main river opposite this house and quay which as far as I can tell can only be accessed from the water. 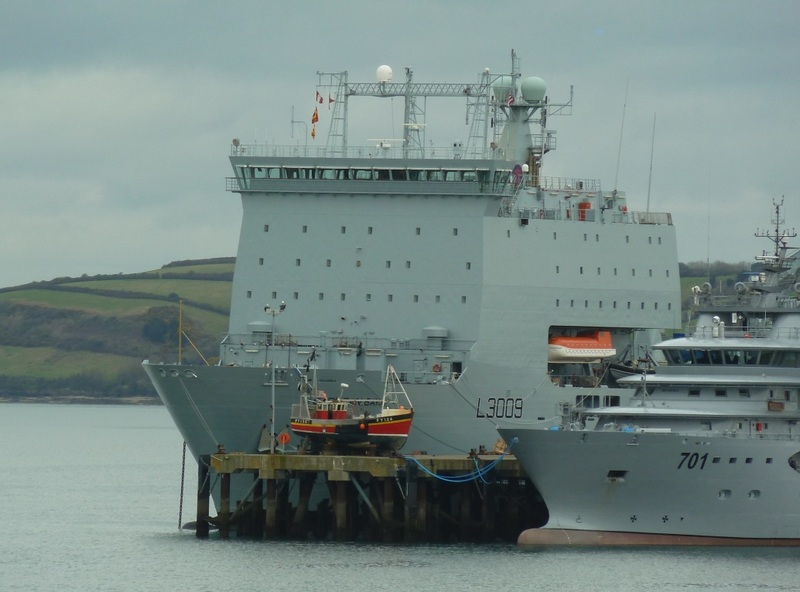 She is also sporting new paintwork, I think the grey really suits. 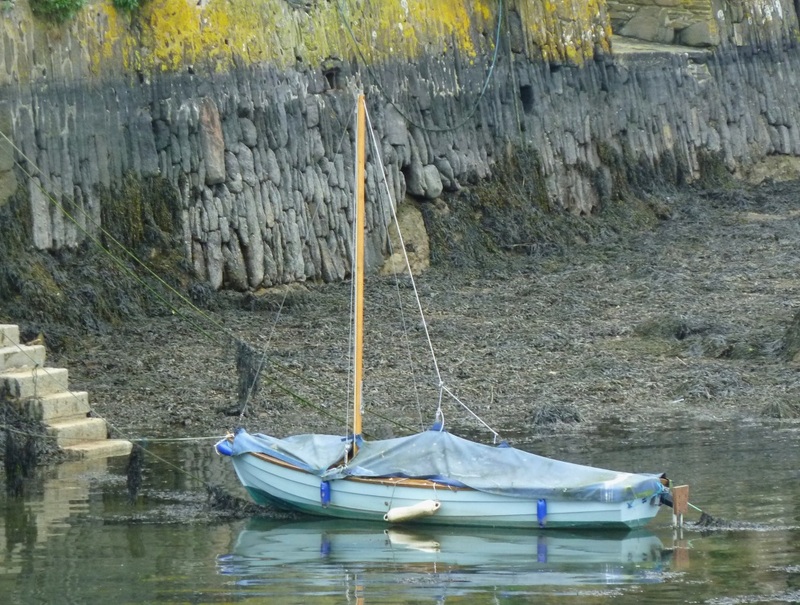 It seems I'm not the only one to notice her, fellow blogger Steve featured an almost an almost identical picture from his recent meanderings in Fowey. 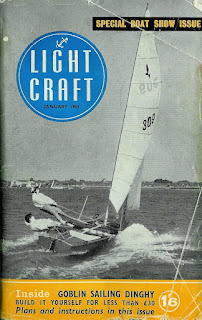 Clearing out the attic recently I came across these two copies of Light Craft magazine, I can remember my dad taking me to the Earl's Court boat show for the first time and I'm guessing it was in 1964. 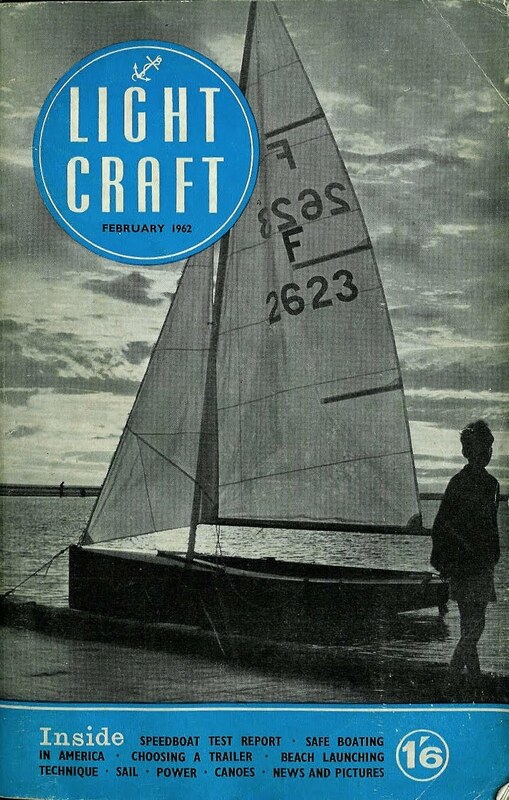 He came back with the idea of building the Goblin dinghy which featured in the January edition. 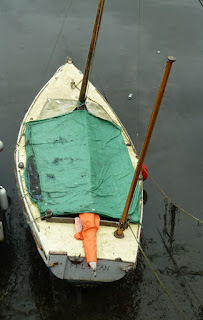 I can recall the plans being on a shelf in the garage probably until we moved in the late 1970's, alas other things got the way and he never got beyond looking the plans over from time to time. 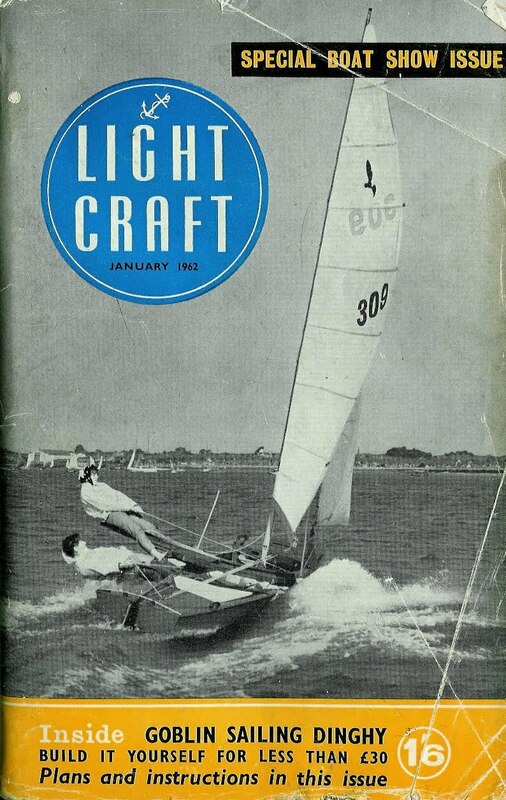 The February 1964 edition has a Firefly dinghy on the cover, almost 50 years on there's a fleet at Hamble River Sailing Club which shows the appeal of the design. 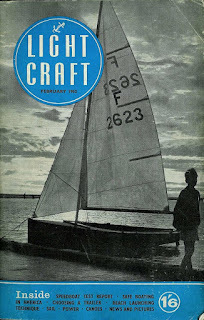 Despite the small format and poor quality black and white photographs what is interesting reading through these old magazines is the broad approach they took to boating, sailing dinghies, small yachts, motor boats and even canoeing was featured, very different to the highly polarised and focused boating magazines of today. With Joe's interest in railways we've been visiting model railway exhibitions during the winter weekends, this is one of his favorites not only as it features Thomas the Tank Engine and his friends, but the owner has set it up so that small children can drive the trains using a "Scalextric" controller. 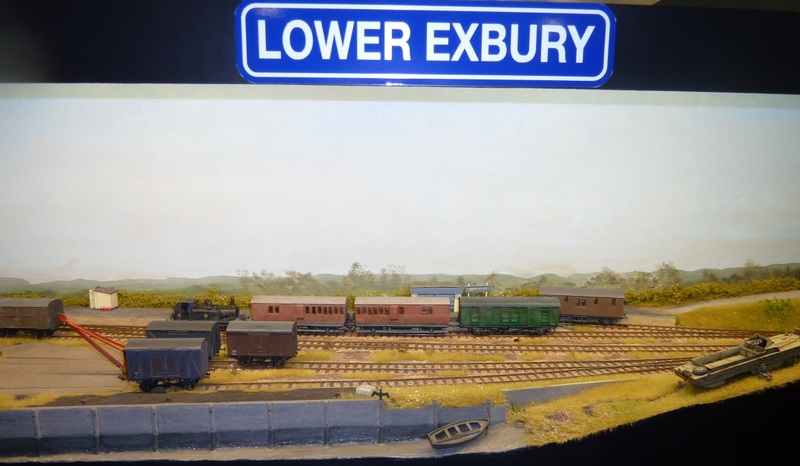 This model was intriguing, based on an imaginary branch line to Exbury in the New Forest. 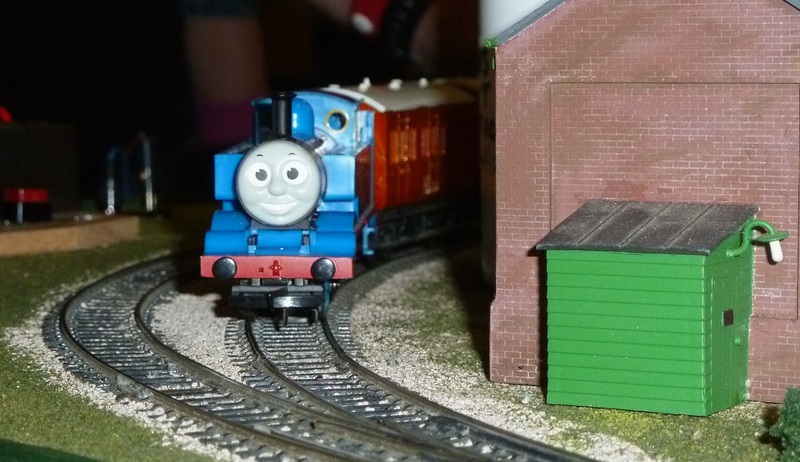 Apparently the "South Western and Isle of Wight Junction Railway" really did plan to dig a two and a half mile tunnel under the western Solent to link the Lymington and Freshwater lines. The Solent Tunnel Project was approved by an Act of Parliament in the 1903, but the project was abandoned during the First World War of 1914-18. 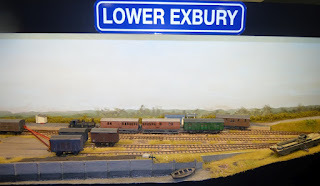 The modeller who created this layout based it on an imaginary spur, which would go off from what would have been the main line, leading down to Exbury on the Beaulieu river, clearly the landing craft sets the scene during or after WWII. The line would also be used to carry bricks and other goods from the Exbury estate. 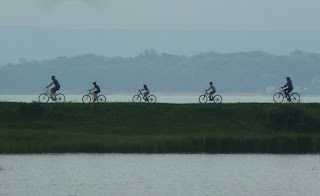 What a great and imaginative project. 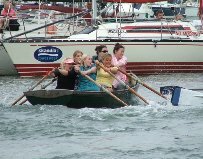 Hamble River Rowing Club are holding an open day this Saturday 21st April from 10.00AM at the Jolly Sailor, Lands End Road, Bursledon. 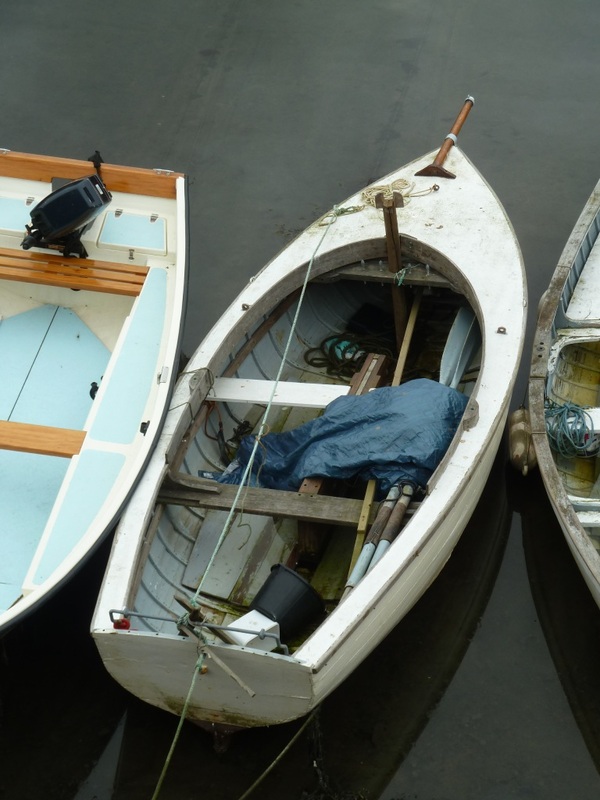 Hamble River Rowing was set up to promote traditional rowing on the river, rowing takes place on Tuesday evenings and weekends during the summer. 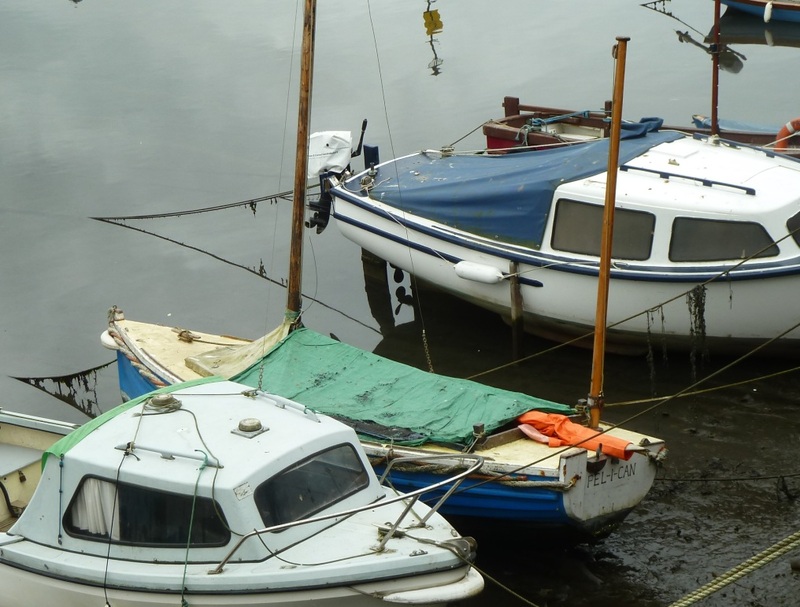 A great way to exercise or just a good excuse to get out and enjoy the river, if you would like to have a go then drop by on Saturday. 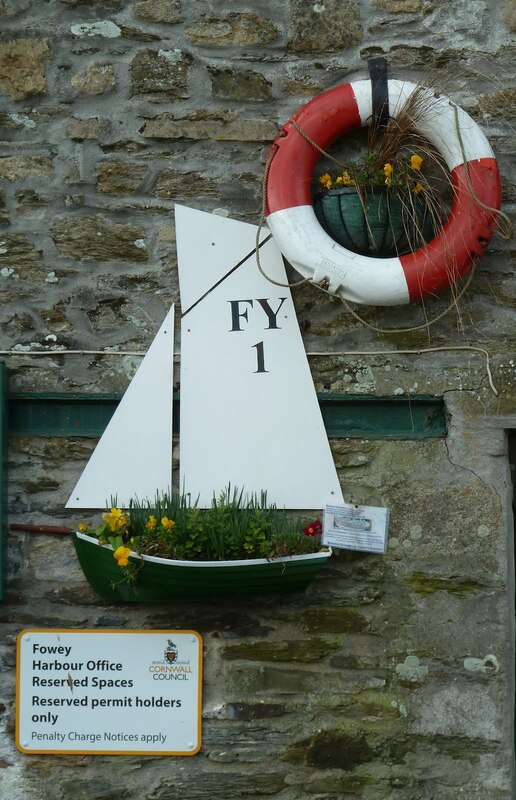 Fowey harbour office - a permit for petunias perhaps? 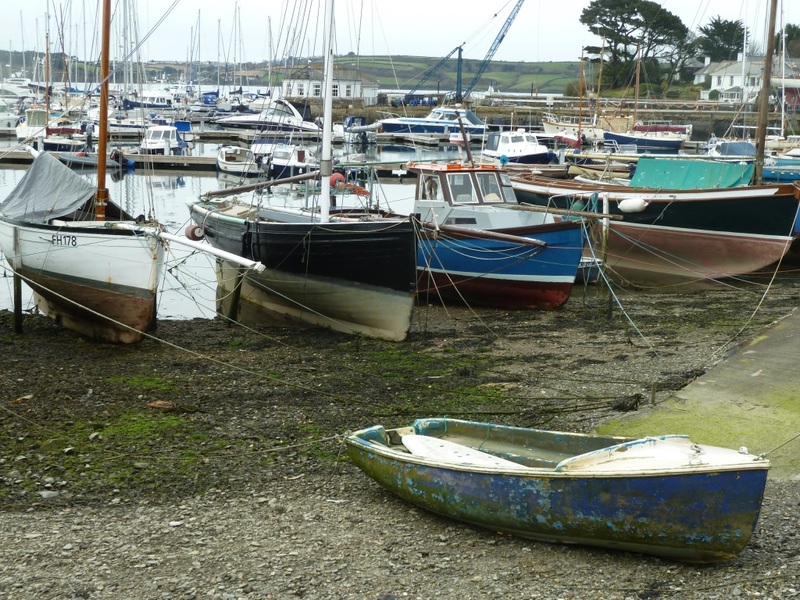 I've probably mentioned it before but I have a real thing for traditional day boats, so walking along the town quay in Falmouth recently I couldn't help but stop and look. 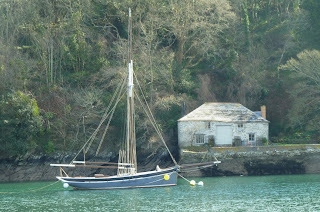 Perched on the edge of Carrick Roads, surrounded by the delightful Cornish countryside I can't think of a better place in England to enjoy sailing an open boat. 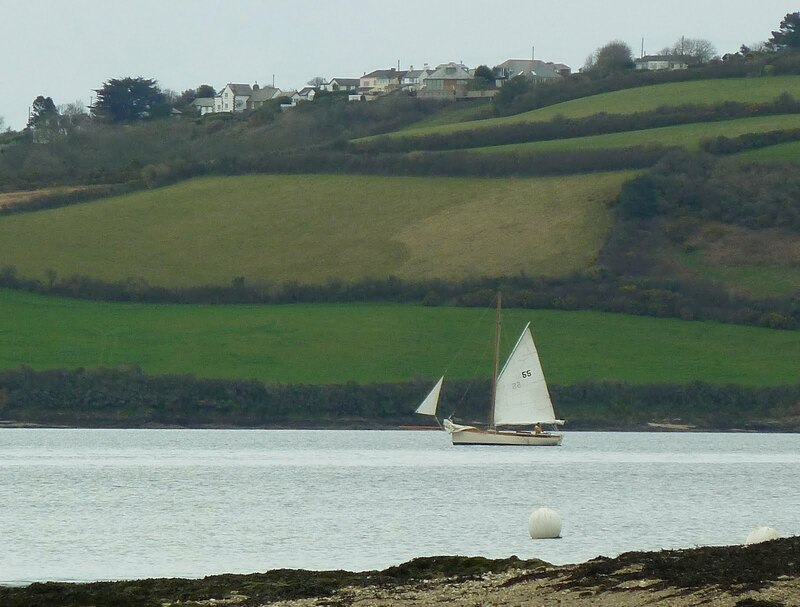 It was difficult to get a good picture of Pelican (above and below), so you'll have to take my word for it she is one lovely yawl (or probably a ketch which doesn't seem an appropriate description at all). Having a mast at each end would keep the cockpit free at anchor for a picnic lunch or a spot of fishing, ideal for hanging a sun shade when things get too hot. Further along towards town and altogether in better condition, ready for the season and about the size of a Wayfarer, but I'm willing to bet there's a heavy metal center board, slower possibly, but the stability and comfort will be rewarding. 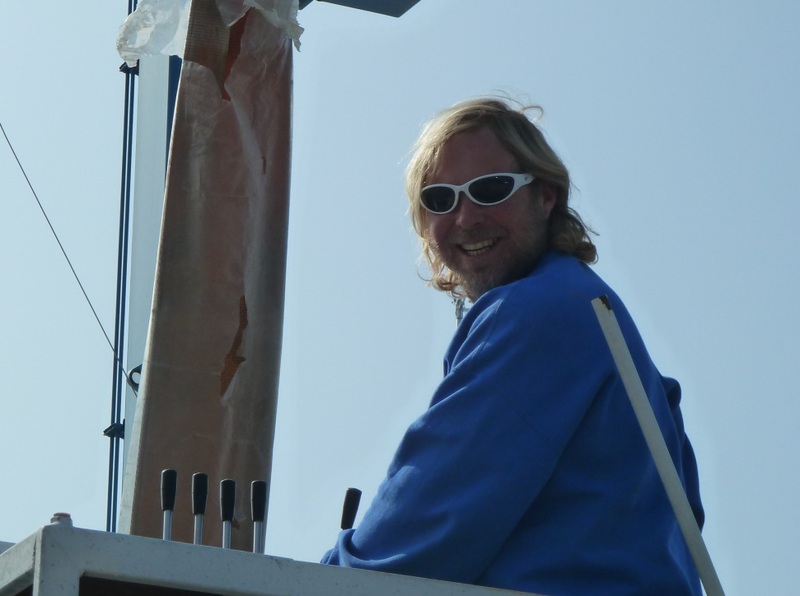 Gaff or gunter rig to keep things simple and the sails and spars will stow inside the boat. 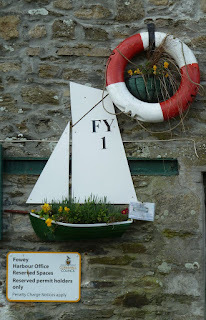 My post on Roche rock prompted some comments about English churches often being built on the site of previous pagan places, the yew tree is a popular accepted sign that the church was built on a previously pagan site. Indeed there are accounts that in 601 A.D. Pope Gregory advised the clergy not to destroy places of Pagan worship but to convert them into Christian Churches. The yew tree had been connected with the journey to the underworld in many pre Christian religions and as an evergreen plant the yew was perhaps a symbol for the regenerative power of nature. It may also have been that wild yews became scarce due to the early medieval longbow production, while Churchyards offered protective enclosures for the tree. 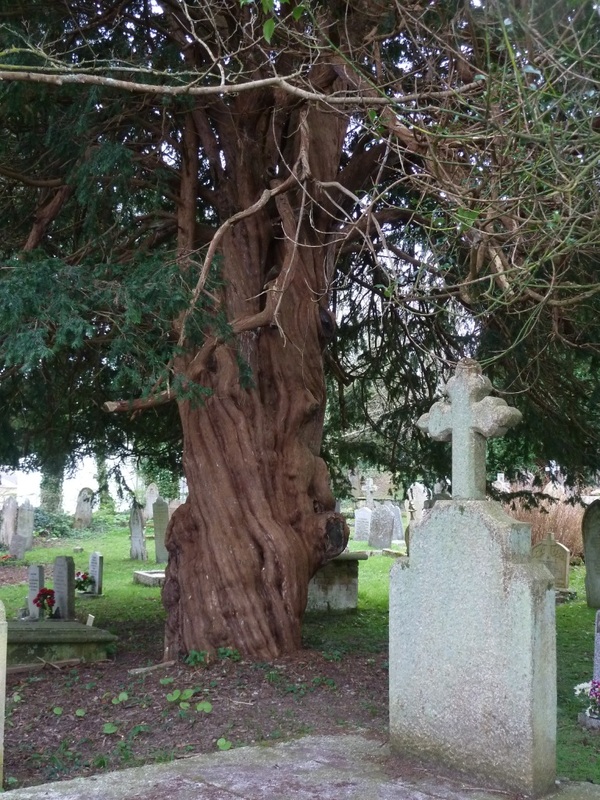 Whatever the history the yew in the church yard of St Mylor's on Carrick Roads provides shade and peaceful protection such that it seems a very intrinsic part of a sacred place. More locally when not rowing, fellow blogger Chris Partridge maintains an interesting blog "Looking at Sussex Churches" many of which feature a yew tree in the grounds. 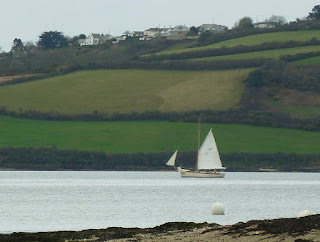 Carrick Roads, Cornwall, the fishery doesn't permit oyster dredging under engine power, so a fleet of traditional boats still work this delightful estuary under sail. Other members of the fishing fleet hauled up on the hard at Mylor. 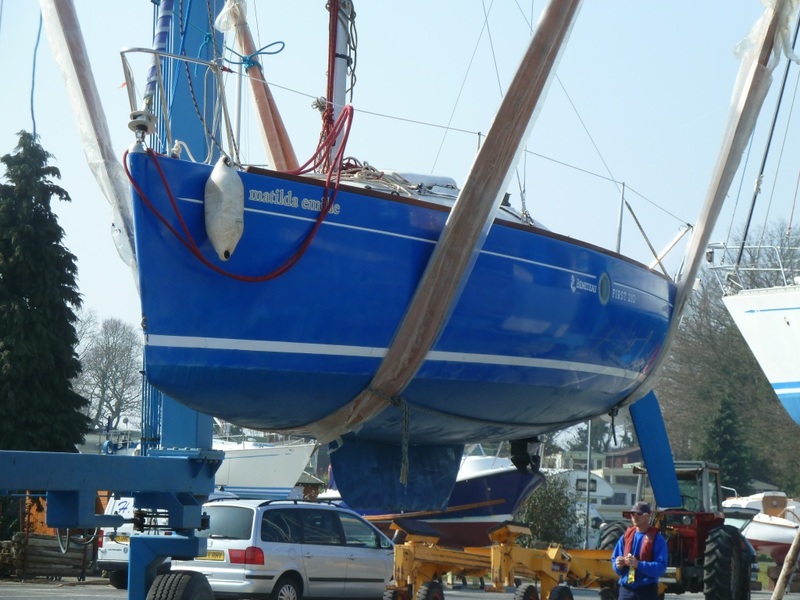 If you've been following this blog for any time you will probably have noticed that I like traditional boats, so when we sold Greta our gaff rigged Cornish Yawl we were doing some serious head scratching over what we should get as a replacement. 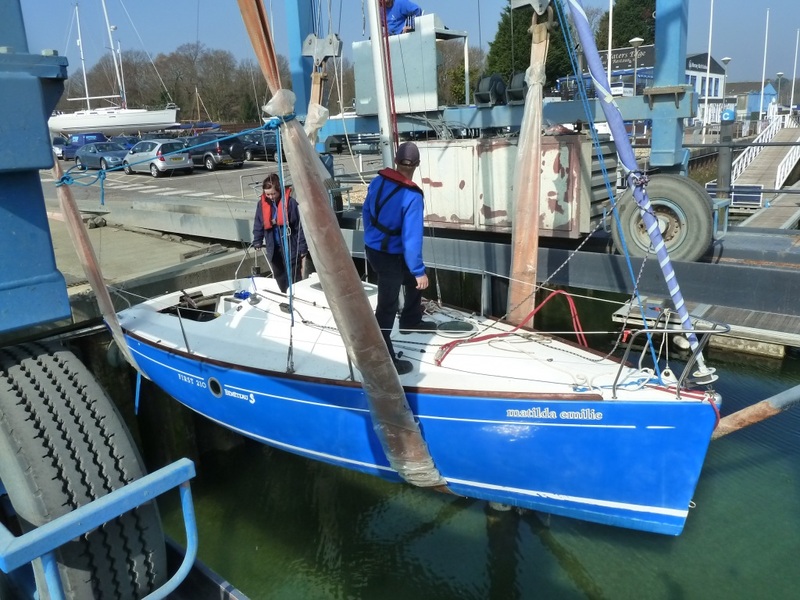 There was a very short dalliance with a Drascombe Coaster, a very short dalliance, in the end we decided on something that not only only sports triangular sails but twin rudders to boot! 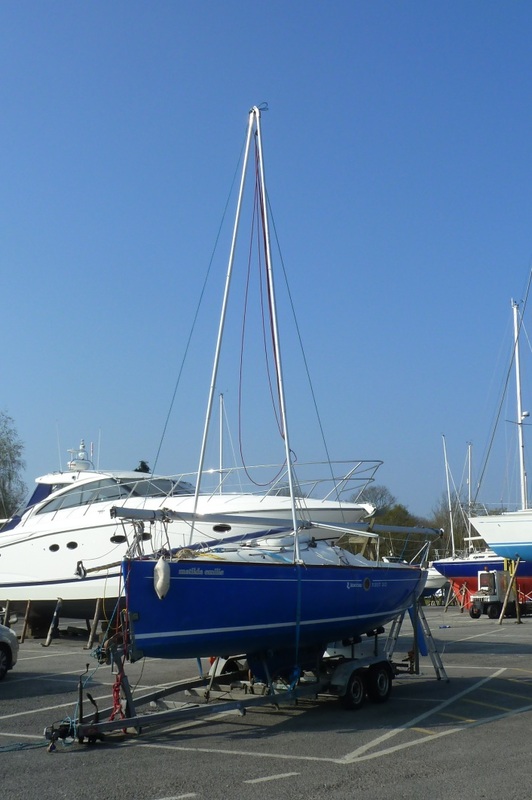 It's a long story but the Beneteau First 210 which had piqued our interest just after we sold Greta was on the market, so we start the season with a go faster, space machine. Friday saw father in law David, fellow blogger and boat builder Graham and myself down at Mercury Marina trying to fathom the intricacies of the mast raising legs, I'd like to say third time lucky, but it took four attempts to swing things into place, probably a good job there were no health and safely folks around! With the mast up Matilda Emily was soon in the slings on the travel lift and on her way to the water. 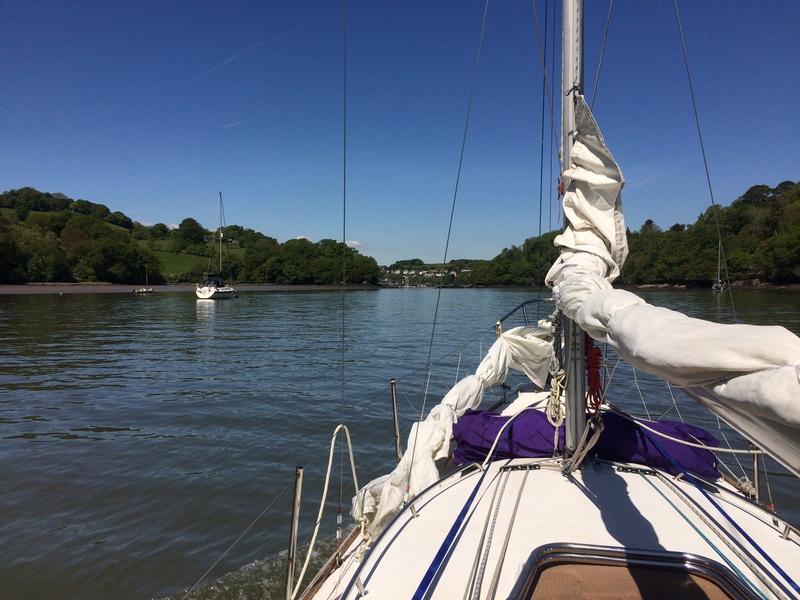 I want to say a thank you to the staff from HYS, they were really helpful and very friendly and made the whole procedure relaxed, easy and safe. In the water, we soon had the engine running sweetly and motoring down river to her mooring, there is quite a bit to do to get her sailing hopefully it will all be done for the upcoming Easter weekend. 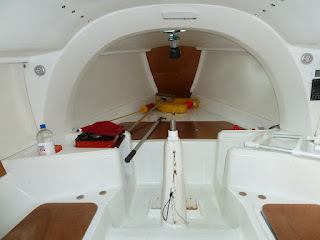 The eagle eyed may have noticed the fresh varnish, there are only 7 pieces of wood in the cockpit, seemed a shame not to get them looking their best - old habits die hard even on a modern hot rod! Looks like they should be safe enough, but exactly how much is the price of cod these days?